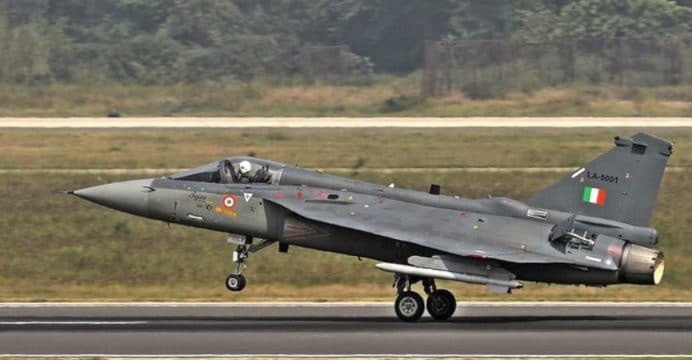 The Indian Air Force (IAF) is reportedly planning to increase its planned induction of the Tejas multi-role fighter from the 123 already on order with another 201 fighters. However, this is contingent on Hindustan Aeronautics Limited (HAL) succeeds in bringing the much improved Tejas Mk2 to fruition. The Times of India reports that the decision came amid concern of the IAF not fielding a sufficient number of modern fighters to withstand a two-front confrontation with China and Pakistan. Furthermore, imports – especially of high-end American or European fighters – would not be feasible. In the meantime, the IAF has (of the 123 already on order) 83 Tejas Mk1As on order. These fighters will be equipped with active electronically-scanned array (AESA) radars and improved onboard avionics and integrated electronic warfare (EW) and electronic countermeasure (ECM) systems. However, the Hindustan Times outlined that HAL is having difficulty committing to the IAF’s present order. Of the 20 aircraft it was supposed to deliver by Q1 2018, only six have been delivered. To remediate the issue, HAL will reportedly outsource roughly 70% of the Tejas’ production inputs to India’s private sector. HAL aims to increase the annual production output of the Tejas to 16 aircraft by 2019. The launch Tejas order of 123 had come at a total cost of Rs. 75,000 crore – i.e. $11.5 billion US – and led to some criticism of the price. However, that price includes the cost of research and development (R&D), the actual flyaway cost is lower. For India, it would be beneficial to scale the Tejas’ development overhead, hence the push by the IAF to make the fighter a mainstay asset through the long-term. According to IHS Jane’s, a higher-output engine – i.e. General Electric F414-GE-INS6 – is among the main changes to the forthcoming Tejas Mk2. The IAF reportedly expects the Tejas Mk2 to also exhibit increased fuel capacity and armament payload along with improved onboard electronics. However, with it still being “on the drawing board” (according to a source quoted by the Times of India), it is a long-term factor.